Google Analytics has only been available for about two years, but is already used by one third of the top 500 websites in the world. We here at Pingdom use Google Analytics ourselves and were curious to see how many of the top web properties out there use it. 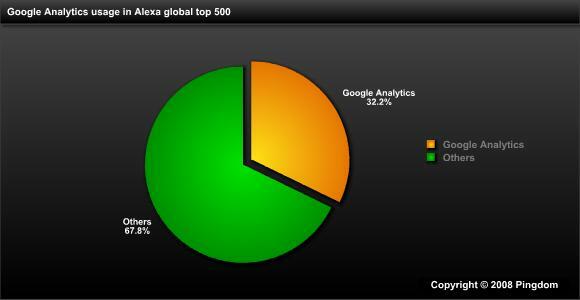 We put the Alexa global top 500 websites under the microscope and found that 161 out of these 500 websites are using Google Analytics, which is 32.2%. Google Analytics was released in November 2005, but the initial storm of signups forced Google to restrict signups until August of 2006, when the service was made generally available. Before Google purchased Urchin (which Google Analytics is based on), it was just another statistics package on the market. Google has basically taken a commercial service, rebranded it and released it for free, giving it a significant competitive advantage. Why pay for other, similar services when you can use Google Analytics for free? Even though website statistics is only a secondary market to Google, the free availability of Google Analytics must have had a profound effect on the bottom line for competing, commercial products from companies who cannot afford to offer their services for free. About the survey: We only accessed the initial page, for example www.cnn.com, and checked if the HTML code contained a reference to either “google-analytics.com/urchin.js” or “google-analytics.com/ga.js”. The thing to remember is that almost nothing is free. Google is giving away the service in exchange for something. I suspect they are using the data from Google Analytics as part of the their search rankings. And who knows what else. It’s an absolute goldmine of data!!! Actually Stphane, that’s not true. I have a Google Analytics account and they let people like me choose whether to share the data or not. If you read the FAQs it specifically says they aren’t using this data for ranking of websites. My belief is that Google is under too much scrutiny to do stuff like that without jeopardizing customer trust…. which is everything to them. The reason they make it free is because they want to sell more keywords. I don’t have an AdWords account though and I use Google Analytics for free, but when my business gets bigger I’ll probably start advertising and bam, they got what they want and I got what I want, so it all works out. I wish they did give more of this stuff away for free, it is a win win. Google analytics is the best free analytics service. They asked me whether you are interested in sharing data or not. I shared data which is actually beneficial for small publishers as they can actually better optimise adsense on our sites. But some technocrats are always interested in bashing Google. Thanks for producing this data, it is very helpful. One concern I have had for a while is whether or not Google will eventually start to capitalize on this by charging. If you think about it, that is how much of the web has evolved… get people hooked on free stuff then start to charge them for it. Great post. However you should have checked also for Omniture/HBX. I bet they come pretty close to Google Analytics for the top 500 sites. Ya I think Google s policy is really good first give it free and leave an advanced option to buy hope same for Google Analytic. what is the last state of using google analytics with percent? Any update for this topic?